The link to excessive weight gain, obsessive exercise, and other addictive disorders can be found in the neurochemistry of the brain within the nucleus accumbens. Certain events and compounds activate the release of dopamine, the brain altering neurotransmitter. When dopamine is released a sense of heightened euphoria ensues. This feeling is so powerful that it becomes highly addictive. But the problem is the more the cycle is signaled the less dopamine is released. 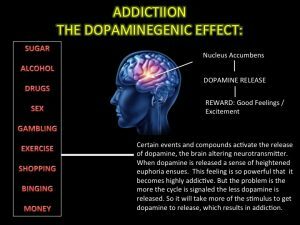 So it will take more of the stimulus to get dopamine to release, which results in addiction. Once this feedback loop is broken it produces drastic negative and positive mood swings. Low production of Dopamine will result in depression, chronic fatigue, pain, and ill feelings. With a high production of Dopamine, which most people are striving for, result in heightened awareness, pain relief, comfort, “love feeling”, and contentment. Though some people are born with a dopamine imbalance associated with Manic Depression. I feel that Manic Depression can be greatly INFLUENCED by eating too much sugar throughout life (sugar is found in food and alcohol). Sugar activates the dopaminegenic effect. In chronic cases, more sugar must be consumed to get a “hit” of dopamine. After a while the sugar will no longer stimulate the brain like it once did and satisfaction is not resolved, therefore the person must continue to eat more to try and satisfy their discomfort. One side effect is usually excess fat storage– OBESITY. Like I have always said. GOOD MENTAL HEALTH is not the NORM in society. Sugar and other mind stimulating compounds that produce neurological dysfunction is the culprit to much of the collective imbalances within society, and the root of all addiction. Spread the education. Please LIKE THIS PAGE and share with friends and family! Thanks!